Salon Muse: Stay On Trend With A Manicure or Pedicure Today! With the excitement of warmer weather, sandals, and bright colors, making sure that your nails are on trend is important. In this blog, we’ll discuss some upcoming trends that will be perfect the next time that you make an appointment for a manicure or a pedicure. At Salon Muse, we’re dedicated to providing a relaxing and rejuvenating experience for all of our clients. Make an appointment with Debbie and your nail color will be sure to be the envy of all of your friends. Call us now! Not surprisingly, soft pink is a beautiful and flattering shade on everyone. It also lends itself to being less noticeable if the polish happens to chip. You’ll be able to enjoy the ability to wear this soothing shade with everything in your closet! Coming back full force, metallics are on trend for the spring season. Some individuals might be a little intimidated by the saturated colors and shiny finish, but if you think of your nails as an accessory to your look, you might find metallic polish to be your new favorite choice for your next manicure or pedicure. White is the new black and actually can be seen as a neutral during this season. If you’re working on a summer tan, the white polish will offer an intense contrast and even make you appear tanner. Designs are definitely popular for spring. With options for bright colors and funky shapes, the possibilities are endless and this is a great way to show your personality through your nails. Don’t allow those finger or toes to go without some fun colors or designs! 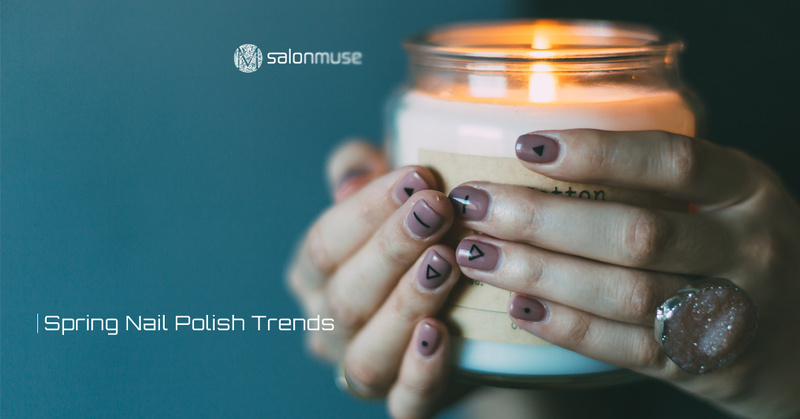 Stay on trend with Salon Muse! Call today for an appointment!